Nothing is more relaxing than a great cup of tea. Sit back, kick off your shoes and sip away. All your stress and frustrations will melt away and you will feel calm and rejuvenated. In a mad frantic office environment, when stress levels are running high, this may not be possible. So do the next best thing. Grab hold of your stress tea cup toy and smash it on your desk. It won't spill, crack or mess and you will soon feel a whole lot better. You are also guaranteed to put a smile on everyone's faces. This fabulous little toy will save the day. It is manufactured from a pliable material that can be squashed and squeezed and will always retain its shape. It features a classic tea cup shape in a light colour filled with tea to the brim. A handle on the side finishes off the authentic look. Make a fun impact at your next corporate event when you brand these tea cups with your logo and hand them to clients as give-aways. They are sure to create a feel-good vibe. They are ideal for companies selling tea or coffee, food and beverage businesses, restaurants, fast food outlets and any company where a strong cup of tea makes its mark. 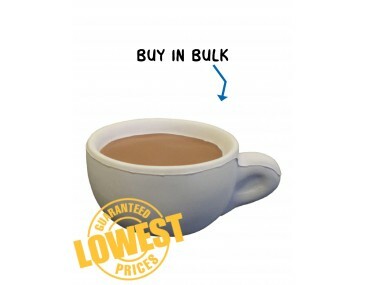 Our listed price includes branding of your logo or graphic in a single colour print onto the tea cup. We offer a product turnaround time of two weeks, but we can offer even faster turnaround times for urgent orders.Our prices exclude GST and a print set up of $75 applies. We can supply this product unbranded if required.